Published on December 9, 2008	in Crafty, Quilting and Sewing. 3 Comments Tags: d&s wedding quilt, Quilting, quilts, Sewing. Remember that quilt I was planning a while back? Yeah, I forgot about it too… Back when we found out they were getting married N and I decided to sew a wedding quilt for his brother and his wife. I got as far as cutting out the pieces before the wedding took place, but work and sewing wallets and bags took precedence so I haven’t touched it since September. 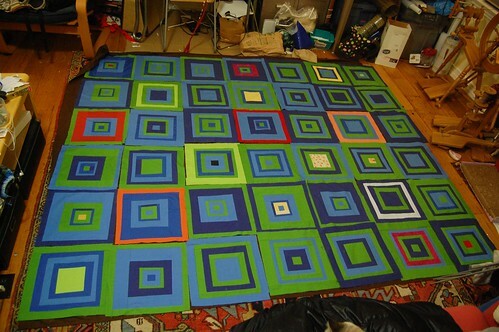 I left the rest of the block piecing to n while I worked on other things. I won’t say he was diligent, but he did eventually get through them and the quilt squares are all finished. Last night I laid them all out on the floor. There is a bit of a tighter fit in our apartment now (compared to the last time I did this) but I made enough space to lay out the design. 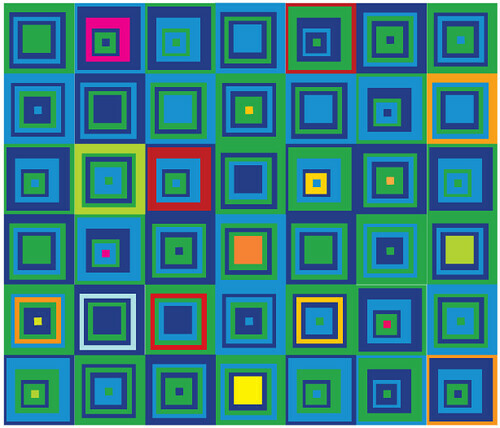 N took things a step further and wrote a computer program to search for the optimal quilt layout based on edge color, center color, block type and highlight color. With 42 blocks there are 1×10^51 combinations possible. His program was still searching, but we took the best result so far and laid out the design. Since the colors are fairly well distributed within the blocks, all of the desings look similar to me. 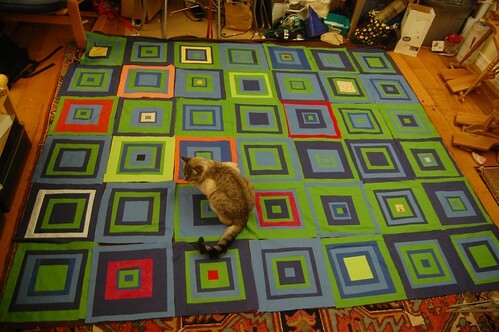 I haven’t picked one yet, but since I picked up all of the blocks off the floor (If I don’t, the cat makes a mess of it) when I put them back down again I will surely make a new pattern. Who knows, maybe after another day of optimizing N’s program will give us the best result of all! Last weekend, while visiting the grand opening of the A Verb For Keeping Warm Workshop, I met some folks who suggested I take my bags over to a gallery space nearby. I did, and now there are a few bags and wallets for sale (in public!) should anyone happen to stumble upon them. The gallery is called blankspace and carries lots of cute handmade items, many of which I recognized from other local etsy sellers. I hope it goes well, but I’m not getting too excited this time. !! That quilt rocks. And, I love how the cat has positioned herself right on it. Animals, gotta love them. I am so glad to hear that you have stuff at Blankspace. Your stuff is so darn cute. The quilt looks awesome! I love the colors. Love it! I really like to slightly off-centered nature of the squares. It makes the pattern very sophisticated. 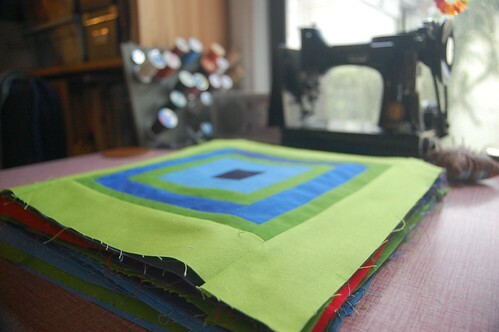 I hope several quilts partly started. Maybe I should pull them out.